Brethren of Lodge Gomantak No. 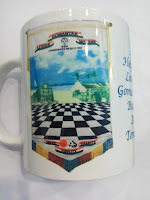 248 along with other Lodges of North Karnataka area hosted an Especial Communication of the Grand Lodge of India at Highland Beach Resort, Candolim, Goa on 6th June 2015. During the first twelve years after the formation of GLI, quarterly communications were organized, but the practice was discontinued and only annual Grand Festivals were held. This is, therefore, the first such half-yearly Especial Communication to be organized by GLI. Bre5hren of Lodges of Goa and North Karnataka Area are proud to be selected for organizing this unique event. The Especial Communication, which began at 5.00 P.M., was preceded by a Half-yearly Communication of the Grand Lodge of Mark Masters of India at 4.00 P.M. the same evening. Both the meetings were attended by brethren from across the country in large numbers, including two past RGM's, all the four ruling RGM'S, the Grand Master elect and the Grand Master. Later in the evening, delegates partook of a sumptuous dinner and great fellowship. Arrangements for the stay of the delegates had been made at the venue of the meet. A raffle and an auction in aid of the Temple Project of Lodge Gomantak No 248 were arranged by W. Bro. G. Richard Gould, IPM of the Lodge, in which delegates participated enthusiastically. The next morning, The Regional Grand Lodge of Southern India organized a Retreat wherein learned papers were presented. These comprised a paper on "How Many Hirams are there in our Craft Ritual" delivered by W. Bro. G. Richard Gould, "The Masonic Path to Light", a power point presentation by R. W. Bro. C. S. Madhavan, and the prize-winning essay on "To improve the Morals and Correct the Manners of Men in society must be our constant endeavor" read out by W. Bro.Sreedharan Srikanth. Simultaneously, a workshop on "Mentoring" for the mentors of Goa and North Karnataka area was organized by the ARGM of the area, W. Bro. C. Nagaraju. R. W. Bro. Sharath Choudry the Chief Regional Mentor of Southern Region, was the resource person of the workshop. Both events were attended by brethren in large numbers. Brethren departed from the campus after a delightful lunch, and all expressed their appreciation of the arrangements and hospitality offered by the organizers. Thank You FreeDNS. Watermark theme. Powered by Blogger.